I’m officially hooked on happy sink flowers. Do you know even know what I mean by “Happy Sink Flowers?” I guess it is a term that I have made up in my own head? (I do that a lot). 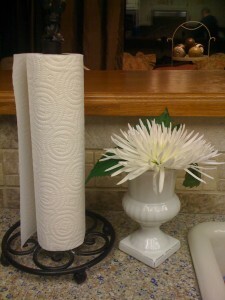 It comes from the people who say that fresh flowers next to the sink make them happy. And I now agree. 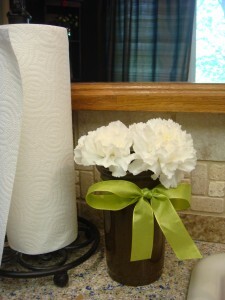 I have tried this for a couple months by just putting fresh flower(s) from my yard or from the store in a pretty little vase. But for me, it’s like Christmas in May when these pianis come up in my side yard. 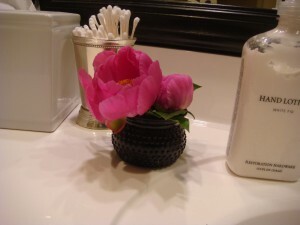 Although they have not exactly bloomed yet, I still just had to drop a couple in a votive holder and place them in my bathroom. The other day I found a really cute vase at Hobby Lobby for two buckaroos that I dressed up with a ribbon and a pop of color! And since Melissa is having her Friday Beautiful Life party today I thought I would also borrow a little inspiration from her new green chairs! Seriously, now when I’m driving around I tend to have the desire to stop and pick flowers from yards. I’m not saying I do - I just want to!! I have more obsession with all things flowers, including my take on using flower pots and other fellow bloggers creative flowering ideas, in my newsletter that I’m sending out in a couple days. If you are not already signed up you can click the side button and I’ll send you my May Flowering Ideas Newsletter along with some very exciting Etsy and Giveaway news! What a great idea! 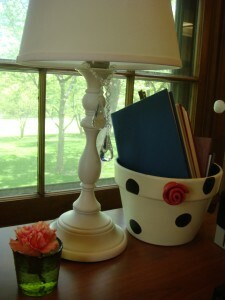 This would be a lovely way to brighten up the kitchen or bath! 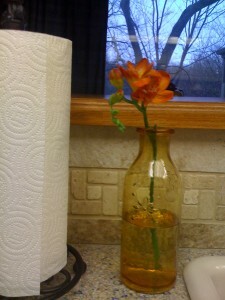 Right now, I have a pitcher of flowers by my kitchen sink and think that’s the best place to put them! Love all of these… picking flowers from your garden and placing them in your home is DIVINE! 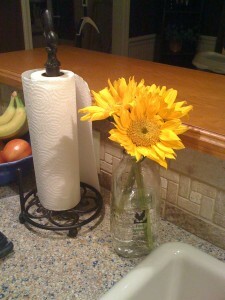 How happy is a single flower next to a sink? I love it. I love this idea! 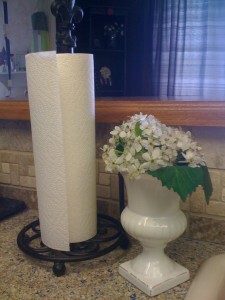 Your photos really help to show how nice it is to have some cheery flowers while you do dishes! Those little Happy Sink Flowers spread so much cheer - I love them! Just left you an award! I couldn’t agree more! Just one little bloom can make me so happy.